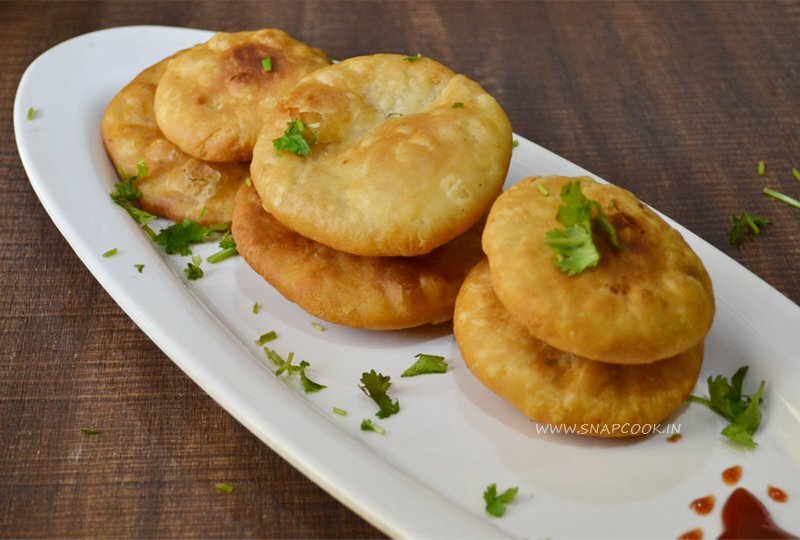 Khasta kachori Recipe in 3 styles, filled with spicy stuffing. Holi Special Recipe for your guests. Serve it with green chutney or sauce. Take 2 cups all-purpose flour. Add ¼ cup oil and salt. Mix it by rubbing the flour and oil using your fingertips. It should looks like breadcrumbs. Cover it with wet cloth. Wash and soak ½ cup chana daal for 1- 2 hrs. Drain the excess water and coarsely grind the daal in mixer/blender. The quantity of daal is now approx. 1 cup after soaking. Add 1/8 tsp hing, 1 tsp grated ginger. Fry it for few seconds. Add soaked and coarsely grind chana daal. Mix well. Add ¼ tsp red chilli powder, ½ tsp roasted cumin seeds, ½ tsp dry mango powder, salt. Mix well and cook till all the moisture has dried up. Wash and soak ½ cup Dhuli Urad Daal for 1- 2 hrs. Add 1/8 tsp hing, 1 tsp grated ginger, ¼ tsp fennel seeds, ¼ tsp coriander powder, green chillies. Fry it for few seconds. Add soaked and coarsely grind urad daal. Mix well. Add ½ tsp Chaat masala, ½ tsp Amchur powder, ¼ tsp red chilli powder, salt. Mix well and cook till all the moisture has dried up. Add ¼ tsp Garam Masala. Add ¼ tsp fennel seeds, ½ tsp coriander powder, ½ tbsp grated ginger, Green chillies. Fry it for few seconds. Add boiled and coarsely grind corns (sweet corns). Mix the mixture well. Now add ½ tsp chaat masala, salt. Cook till almost the mixture has dried up. Add grated cheese, coriander leaves. Mix well. Knead the dough again and make it smooth. Divide the dough into 14 equal portions and make it small balls. Take each ball and roll out into small puris. Place a portion of stuffing in the centre and bring the edges together to form a ball. Flatten slightly. Heat sufficient oil in a kadai and deep fry kachoris on low heat for three to five minutes or until golden brown and crisp.